AutoCAD is used to design products and optimize structures according to Limited Element Analysis Theory Possible defect elements are carefully considered in the manufacturing process and safety factors are calculated based on real working conditions. Product moulds are designed by Castsoft CAD and casting technology is designed by Castsoft CAE to imitate the iron liquid casting system.which ensures the whole system is always under the best condition and avoids possible casting defects. Dimensional tolerance is guaranteed by correct choice of casting modes and strict control throughout the whole manufacturing process. Mechanical properties of the materials are affected by the composition of the casting Spectrographic analysis is utilized to ensure the composition of the iron structure. 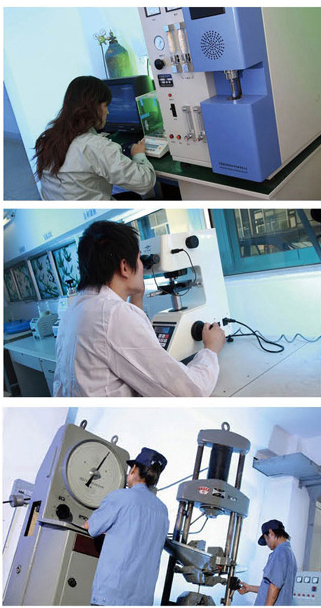 Products from each furnace are manufactured in strict compliance with quality standard as materials are given compositional test,metallographic test and mechanical property test.Each product has a test report which will be stored for more than 20years according to relative standards. 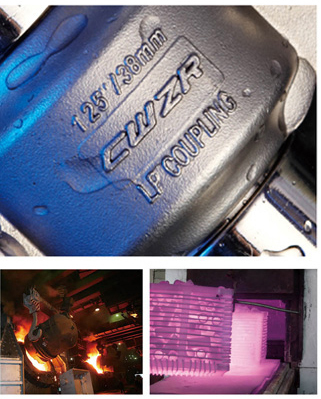 Product appearance reflects the levels of casting quality and dimensional control. UL213 and FM1920 Test Standards are strictly enforced Static pressure strength and bending tests are carried out for each specification to ensure the safety of piping parts under various application application conditions. Production And Material Test Sealing gaskets with high mechanical properties are the key to ensure piping system long term safety,Rubber tests are undertaken in strict accordance with International Standards. Add:No.2 B building, No.757 Mingzhu Road,Binhai Park,Wenzhou City,Zhejiang,P.R.China.